Though barely remembered now, both Salomon Jadassohn and Felix Draeseke were major figures in German musical life in the second half of the 19th century. Both began their studies at the conservative Leipzig Conservatory but after independently encountering Liszt and his work at Weimar in the 1850s both became disciples of that composer and the New German School he established. Jadassohn subsequently returned to Leipzig where he composed and had a long and distinguished teaching career, his pupils including Delius, Grieg and Busoni, while Draeseke finally ended up in Dresden teaching at the Conservatory there. 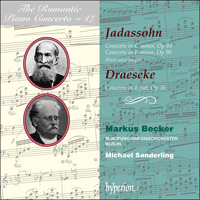 In a further paralleling of lives, both composers’ concertos were written at almost the same time—Draeseke’s sole example in 1886 and Jadassohn’s two the following year. All three are expertly crafted and feature wonderfully idiomatic piano writing, as one would expect of Liszt pupils. Stylistically they show their links both to Liszt’s single movement forms (Jadassohn 1) and also to more traditional models. While not ground-breaking these are thoroughly enjoyable examples of the genre and one must question why the Jadassohn works in particular, which have truly memorable themes, have been so completely forgotten. We are delighted to welcome Markus Becker in his first concerto recording for Hyperion; expect more soon! Felix Draeseke (1835–1913) and Salomon Jadassohn (1831–1902) were two of the more interesting also-rans of Romantic music. Although Jadassohn was ultimately remembered as the teacher of an amazing array of celebrated pupils—including Edvard Grieg, Frederick Delius and Ferruccio Busoni—Draeseke was a force to be reckoned with in his own right. He was even touted as a serious rival to Brahms as a symphonist, and boldly emulated Wagner with an astonishingly ambitious sacred counterpart to the Ring cycle—a collection of choral works entitled Christus: A Mystery in three Oratorios with a Prelude. This mammoth undertaking was to be performed over several days, with a ‘preliminary evening’ thrown in for good measure. Its first performance in 1912 was a glittering triumph for its industrious composer, but the sheer length of the work, combined with the oratorio genre’s rapid falling out of fashion in the twentieth century, put paid to any chance of sustained success. Few have now heard a note of Christus, and it seems unlikely to overtake Wagner’s Ring in popular affection any time soon. But it was initially Draeseke’s orchestral and instrumental music that was most admired. His Piano Sonata ‘quasi fantasia’ (1867) earned plaudits from no less a figure than Franz Liszt, who considered it to be one of the most impressive of the modern era. (Those who are skeptical about this judgment should seek out a chance to listen to it themselves—it really is a fascinating work.) Draeseke had by then long been an adherent of the ‘New German School’ of Liszt and Wagner, despite his initial training at the notoriously conservative Leipzig Conservatory. Bowled over by hearing Liszt’s performances of Wagner’s Lohengrin in Weimar, he himself took up residence in the small town in 1856, there to imbibe the ‘music of the future’ and participate in the lively artistic life surrounding Liszt. His reverence for Liszt was typically manifested in the composition of symphonic poems after the model of his master. Almost needless to say, the shadow of Richard Wagner fell heavily over his first attempt at opera, the title of which—König Sigurd—immediately betrays its influences. It was, in fact, one of the earliest of those depressingly numerous Wagner-imitations that young German composers had to get out of their system before acquiring their own individuality. Even Richard Strauss went through his own copycat phase with his first opera Guntram, where a forlorn knight mooches around, predictably seeking some sort of ill-defined ‘redemption’ in a manner that suggests an all-too-close study of Wagner’s Parsifal. Draeseke’s respect for Wagner was not reciprocated. The latter seems to have thought little of Draeseke’s music, describing the Germania March—perhaps the only work by Draeseke that Wagner had ever heard performed—as ‘pitiful’. Draeseke, for his part, became gradually more disaffected with the New German School, a process accelerated by his deep disapproval of Wagner’s affair with Liszt’s daughter Cosima. He noticeably began to plough a more musically conservative furrow after settling in Dresden in 1876. In 1884 he was officially enlisted to the staff of the city’s Royal Saxon Conservatory, and spent the remaining decades of his life there. His interests turned increasingly towards sacred choral music, often pervaded by ostentatiously contrapuntal textures of a more conservative style. Liszt was not impressed. On hearing some of Draeseke’s later church music, he commented acidly, ‘it seems our lion has turned into a rabbit!’. Draeseke’s three-movement Piano Concerto in E flat major Op 36 was composed in 1885–6, and clearly demonstrates the more traditional elements creeping stealthily into the music of this erstwhile lion of the avant-garde. The Adagio slow movement, a fairly straightforward set of variations on a hymn-like theme initially presented by the piano, harks virtually back to Beethoven. It is, indeed, rather obviously indebted to the similar slow movement of Beethoven’s ‘Emperor’ Concerto (in the same key as Draeseke’s), without, alas, reaching the rapt intensity of the earlier master’s music. The first variation, characterized by alternating figures in sixths, further reminds us that the later nineteenth century was also the era of Brahms, and those listeners who know the slow movement of Brahms’s F minor Piano Sonata will notice some striking echoes here. But this remains the only Brahmsian allusion in the Concerto, for both the first movement, with its vigorously assertive principal theme, and the last movement, a rambunctious scherzo-finale in 6/8 time, confirm that Draeseke’s model was certainly Beethoven. The quasi improvisatory dialogue between soloist and orchestra that so assertively opens the work once again has origins in the initial flourish of the ‘Emperor’, and Beethoven’s finale is also a rollicking movement in 6/8. Yet Draeseke’s Concerto is hardly a slavish copy of his great predecessor’s. The piano writing, with its plethora of alternating octaves and cascading chords, is very much in the late-Romantic style, and shows that Draeseke’s years with Liszt in Weimar were not entirely wasted. The orchestration, too, is vivid and colourful. There is much to enjoy here, and even if the Concerto’s melodic inspiration is ultimately not the equal of its slick craftsmanship, the piece as a whole hardly deserves the deep oblivion to which it has been consigned over the last hundred years. ‘Solid craftsmanship’ seems indeed to have been the phrase most contemporary critics reached for when trying to give their impression of Salomon Jadassohn’s music, a phrase that no doubt flowed more easily from their pen owing to his reputation as one of the Leipzig Conservatory’s longest-serving composition teachers. Even surviving photographs of Jadassohn promote this image of the strict pedagogue, eyes staring out unwaveringly, sandwiched between a follicly challenged forehead and a correspondingly over-luxuriant beard. Jadassohn had himself enrolled as a student of the Conservatory in 1848, but eyebrows were raised at that august institution when it was discovered that he was occasionally slipping away to take lessons from the arch-enemy Liszt in Weimar. Indeed, despite his basically conservative tendencies, the prolific Jadassohn was somewhat influenced by the music of Liszt and Wagner, nowhere more obviously than in his Piano Concerto No 1 in C minor Op 89 (1887), which forsakes the traditional organization (heard, for example, in the Draeseke) in favour of an interlinked Introduction quasi recitativo, Adagio sostenuto and Ballade. In proportions this turns out to be very similar to Liszt’s first piano concerto, with a relatively perfunctory, improvisatory opening section, a more expansive slow section and then a finale which emerges as the most complex and prolonged movement of all, unfolding in the full sonata-form that the other sections notably avoided. A frenetically agitated coda rounds off this passionate and formally inventive piece. A certain imaginative approach to the usual formal structures is also evident in Jadassohn’s Piano Concerto No 2 in F minor Op 90, composed—as the opus number would suggest—immediately after the first concerto. Jadassohn seems to have been inspired to write the second piece by the opportunities this offered to vary the formal outlines yet again. Here he composes a fairly standard but imposing Allegro energico first movement, in contrast to the fleetingly despairing recitative of Op 89—its grim, march-like main theme sounding to British ears rather like a minor-key version of ‘Men of Harlech’. The Allegro appassionato last movement, too, is in an extended sonata form, the coda this time turning to the major for the celebratory conclusion that Op 89 so signally failed to provide. It is the slow movement, however, that seems to toy most creatively with listeners’ expectations. After a winsome Andantino quasi allegretto tune in A flat major presented by the piano, a short cadenza from the soloist leads into faster music, culminating in an Allegro deciso in F minor that sounds very much like it ought to be the beginning of the finale. The Andantino tune seems only to have been a modest introduction to the last movement—except that it isn’t. The music slows down again, and the Andantino returns, finally fading out in a lazy haze of A flat arpeggios. Startlingly, the reverie is abruptly broken by a dramatic signal on the trumpets. Now we can really settle into our seats for the last movement—what went before was simply a gentle, and ingenious, deception. Having listened to the concertos on this disc, we might pause to ask ourselves what went wrong, why three perfectly respectable, expertly written and reasonably inventive pieces should have been relegated to the dustbin of history after the deaths of their composers? After all, it is not as if every more famous work is a model of perfection. The first movement of Brahms’s D minor Concerto seems to go on for ever once the listener realizes with horror that its composer intends to recapitulate the entire exposition note for note, and the Piano Concerto by Edvard Grieg joins its memorable melodies together by the musical equivalent of string and sticking plaster. Grieg’s teacher Jadassohn is, at least in this respect, a much more accomplished operator. Two possible explanations offer themselves, the one artistic, the other political. For all their compositional adroitness, both Draeseke and Jadassohn lacked the ability to invent tunes that are immediately pregnant with musical possibility, and which obstinately lodge in the mind of the listener. The opening of Brahms’s D minor Concerto is so unforgettably stunning that one is prepared to forgive a certain long-windedness in its subsequent treatment, while Grieg’s Concerto is quite simply a cornucopia of catchy tunes. They may not be flawless pieces, but they are certainly not bland. Furthermore, to Draeseke’s and Jadassohn’s disadvantage, not only was their musical material less initially arresting, but their works were dealt an unexpected blow by history. As a German-Jewish composer, Jadassohn was quite deliberately suppressed in the Germany of the 1930s. After the Nazi period was over, his name was firmly engraved in the list of ‘interesting historical figures’ whose music was not well-enough known even to make a superficial judgment about its value. Draeseke’s fate was more ironic. In stark contrast to Jadassohn’s œuvre, his music was extolled by the Nazis as an example of ‘pure German art’. Indeed, the 1930s saw a mini Draeseke-revival, largely fuelled by official encouragement rather than grass-roots enthusiasm. After 1945 the inevitable reaction took place. Draeseke’s music was tainted with political associations for which the hapless composer was hardly responsible. Once more he became a forgotten man. Around a century after their deaths, this recording finally gives listeners the opportunity to come to their own judgment of both composers. Felix Draeseke (1835–1913) et Salomon Jadassohn (1831–1902) furent deux des plus intéressants petits maîtres de la musique romantique. Si, en définitive, Jadassohn resta célèbre par le nombre impressionnant de ses élèves renommés (dont Edvard Grieg, Frederick Delius et Ferruccio Busoni), Draeseke fut, lui, une force avec laquelle il fallut compter: allant jusqu’à être tenu pour un sérieux rival du Brahms symphoniste, il imita crânement Wagner en se lançant dans un pendant sacré, étonnamment ambitieux, du Ring—un ensemble d’œuvres chorales intitulé Christus: un mystère en trois oratorios avec un prélude. Cette enterprise titanesque devait se jouer sur plusieurs jours avec, pendant qu’on y était, une «soirée préliminaire» en prime. Sa création en 1912 se solda par un triomphe resplendissant pour son industrieux auteur mais sa durée même, combinée à la rapide désuétude dans laquelle l’oratorio tomba au XXe siècle, ruina toutes ses chances de succès prolongé. Aujourd’hui, rares sont ceux qui ont entendu une note de ce Christus, lequel ne supplantera probablement pas de sitôt le Ring wagnérien dans le cœur des gens. Mais Draeseke fut d’abord admiré pour sa musique orchestrale et instrumentale. Sa Sonate pour piano «quasi fantasia» (1867) fut louée par Franz Liszt en personne, qui la tenait pour l’une des plus impressionnantes de l’ère moderne. (Que les sceptiques trouvent le moyen de l’écouter par eux-mêmes—c’est une œuvre réellement fascinante.) Draeseke adhérait alors depuis longtemps à la «Nouvelle école allemande» de Liszt et de Wagner, et ce malgré sa formation initiale au Conservatoire de Leipzig, notoirement conservateur. Sidéré par les interprétations lisztiennes du Lohengrin de Wagner, à Weimar, il s’installa dans cette bourgade en 1856, pour s’imprégner de la «musique de l’avenir» et participer à la vie artistique animée qui s’était développée autour de son maître Liszt, dont il imita, naturellement, les poèmes symphoniques, et il va presque sans dire que l’ombre de Richard Wagner plana lourdement sur sa première tentative d’opéra, dont le titre (König Sigurd) trahit d’emblée les influences. Ce fut, en réalité, l’une des toutes premières de ces imitations wagnériennes, désespérément nombreuses, dont les jeunes compositeurs allemands durent se débarrasser avant d’acquérir leur propre individualité. Même Richard Strauss passa par cette phase de copie avec Guntram, son premier opéra, où un chevalier au désespoir erre ça et là, en quête, comme on pouvait s’y attendre, d’une sorte de «rédemption» mal définie, ce qui suggère une étude par trop minutieuse du Parsifal wagnérien. Le Concerto piano piano en mi bémol majeur op. 36 de Draeseke, en trois mouvements, fut composé en 1885–6 et montre bien la subreptice instillation des éléments traditionnels dans la musique de cet ancien lion de l’avant-garde. Le mouvement lent Adagio, une série de variations assez simples sur un thème hymnique d’abord présenté au piano, rappelle en fait Beethoven. Il est en effet assez visiblement redevable au mouvement lent du Concerto «L’Empereur» (dans la même tonalité) sans, hélas, atteindre à l’intensité absorbée de la musique du vieux maître. La première variation, marquée par une alternance de figures en sixtes, nous redit en outre que le XIXe siècle tardif fut aussi l’époque de Brahms, et les auditeurs qui connaissent le mouvement lent de la Sonate pour piano en fa mineur de ce compositeur en décèleront de saisissants échos. Mais c’est là l’unique allusion brahmsienne de tout le Concerto, car et le premier mouvement, avec son thème principal vigoureusement offensif, et le dernier, un turbulent scherzo-finale à 68, confirment que Beethoven servit certainement de modèle à Draeseke. Le dialogue soliste/orchestre quasi improvisé qui ouvre si péremptoirement l’œuvre trouve aussi ses origines dans la fioriture initiale de «L’Empereur», concerto dont le finale est également un exubérant mouvement à 68. Pourtant, Draeseke a fait tout sauf une servile copie du concerto de son grand devancier. Son écriture pianistique, qui voit une pléthore d’octaves alterner avec des accords cascadants, est vraiment bien dans le style romantique tardif et montre que les années passées auprès de Liszt, à Weimar, ne furent pas totalement vaines. L’orchestration est, elle aussi, vivante et pittoresque. Il y a là beaucoup à savourer et, même si son inspiration mélodique n’est finalement pas à la hauteur de son bel art, ce Concerto ne mérite guère le profond oubli dans lequel on l’a maintenu ces cent dernières années. «Solide métier»: voilà, semble-t-il, comment la plupart des critiques exprimèrent, à l’époque, ce que leur inspira la musique de Jadassohn, d’autant que ce dernier fut parmi les professeurs de composition à avoir enseigné le plus longtemps au Conservatoire de Leipzig. Les photographies qui nous restent de lui corroborent cette image du pédagogue sévère, aux yeux fixes coincés entre un front dégarni et une barbe surabondante. Il avait été élève à ce même Conservatoire, en 1848, mais l’auguste institution avait tiqué en découvrant qu’il filait parfois en douce à Weimar pour prendre des leçons avec Liszt, l’ennemi juré. Car, malgré ses propensions fondamentalement conservatrices, le prolifique Jadassohn fut quelque peu influencé par Liszt et par Wagner, et rien ne l’atteste mieux que son Concerto pour piano no 1 en ut mineur op. 89 (1887), qui délaisse l’agencement traditionnel (respecté, par exemple, dans le Concerto de Draeseke) au profit d’une Introduction quasi recitativo, d’un Adagio sostenuto et d’une Ballade, tous liés. Dans ses proportions, l’ensemble s’avère fort similaire au premier concerto pour piano de Liszt, avec une section liminaire à l’improvisade, assez sommaire, une section lente davantage expansive, puis un finale qui apparaît comme le mouvement le plus complexe, le plus étendu, se déployant dans la pleine forme sonate notablement éludée par les autres sections. Une coda frénétiquement agitée clôt cette œuvre passionnée, formellement inventive. Une certaine approche imaginative des structures formelles habituelles se fait également sentir dans le Concerto pour piano no 2 en fa mineur op. 90 composé—comme le suggère le numéro d’opus—juste après le premier. Jadassohn semble avoir été inspiré à l’idée de pouvoir varier encore une fois les contours formels. Ici, il signe un premier mouvement Allegro energico quelque peu standard mais imposant, à l’encontre du récitatif vite désespérant de l’op. 89—son lugubre thème principal alla marcia sonne aux oreilles britanniques plutôt comme une version minorisée de «Men of Harlech». Le dernier mouvement Allegro appassionato est, lui aussi, une forme sonate étendue, la coda passant cette fois au majeur pour la conclusion célébratoire que l’op. 89 n’avait manifestement pas pu fournir. Pourtant, c’est le mouvement lent qui semble jouer le plus créativement avec les attentes des auditeurs. Passé une enveloppante mélodie Andantino quasi allegretto en la bémol majeur présentée au piano, une courte cadenza du soliste débouche sur une musique plus rapide, qui culmine en un Allegro deciso en fa mineur donnant vraiment l’impression de devoir être le début du finale. L’air de l’Andantino paraît n’avoir été qu’une modeste introduction au dernier mouvement, Mais non: la musique ralentit de nouveau et l’Andantino revient pour finalement se dissourdre dans une indolente brume d’arpèges en la bémol. Étonnamment, un retentissant signal aux trompettes vient rompre d’un coup cette rêverie. Nous pouvons alors vraiment nous installer dans nos fauteuils pour le dernier mouvement—jusque là, ce n’était qu’une douce, et ingénieuse, illusion. Après avoir écouté ces concertos, on peut se demander ce qui a cloché: pourquoi trois œuvres parfaitement respectables, expertement écrites et raisonnablement inventives ont-elles été reléguées dans les poubelles de l’histoire après la mort de leurs auteurs? Après tout, ce n’est pas comme si toutes les pièces célèbres étaient des modèles de perfection. Le premier mouvement du Concerto en ré mineur de Brahms semble ainsi ne jamais devoir finir dès que l’auditeur comprend avec horreur que son compositeur entend reprendre l’exposition note pour note; le Concerto d’Edvard Grieg, lui, unit ses mémorables mélodies avec des ficelles et des sparadraps musicaux. Le professeur de Grieg, Jadassohn, sait, à cet égard du moins, bien mieux y faire. Deux explications s’offrent à nous, l’une artistique, l’autre politique. Malgré leur habileté compositionnelle, Draeseke et Jadassohn n’ont pas su inventer des mélodies d’emblée chargées de possibilités musicales et capables de s’ancrer tenacement dans l’esprit de l’auditeur. L’ouverture du Concerto en ré mineur de Brahms est si inoubliablement saisissante que l’on est prêt à pardonner le traitement un rien verbeux qui vient ensuite; quant au Concerto de Grieg, c’est tout bonnement une corne d’abondance pleine d’airs accrocheurs. Ces œuvres ne sont peut-être pas parfaites, mais elles ne sont sûrement pas insipides. Déjà handicapés par un matériel musical moins immédiatement saisissant, Draeseke et Jadassohn pâtirent aussi d’un coup inattendu de l’histoire. En tant que compositeur juif allemand, Jadassohn fut délibérément gommé de l’Allemagne des années 1930. À la fin de la période nazie, son nom fut résolument inscrit sur la liste des «figures historiques intéressantes», dont la musique n’était cependant pas assez connue pour que l’on émît un jugement de valeur, fût-il superficiel. Le sort de Draeseke fut plus ironique. Aux antipodes de celle de Jadassohn, sa musique fut louée par les nazis, qui en firent un exemple d’«art allemand pur». De fait, les années 1930 virent une mini-résurrection de Draeseke, plus alimentée par les encouragements officiels que par un enthousiasme de la base. Après 1945, l’inévitable réaction ne se fit pas attendre: la musique de Draeseke fut entachée de liens politiques dont le malchanceux compositeur n’était guère responsable. Il retomba dans l’oubli. Un siècle environ après la mort de ces deux musiciens, cet enregistrement donne enfin aux auditeurs la possibilité de se faire leur propre opinion. Felix Draeseke (1835–1913) und Salomon Jadassohn (1831–1902) waren zwei der interessanteren Komponisten der Romantik unter der Rubrik „ferner liefen“. Obwohl man sich an Jadassohn letztendlich eher als Lehrer einer erstaunlichen Liste berühmter Schüler—einschließlich Edvard Grieg, Frederick Delius und Ferruccio Busoni—erinnert, war Draeseke aus eigenem Recht eine Gestalt, mit der zu rechnen war. Als Symphoniker wurde er sogar als seriöser Rivale für Johannes Brahms geworben, und versuchte sogar, mit einem erstaunlich ambitiösen geistlichen Gegenstück zum Ring-Zyklus—einer Sammlung von Chorwerken mit dem Titel Christus. Ein Mysterium in einem Vorspiele und drei Oratorien—es Wagner gleichzutun. Dieses Mammutunternehmen sollte über mehrere Tage mit einem obendrein eingeworfenen „Vorabend“ aufgeführt werden. Seine Uraufführung 1912 war ein glänzender Triumph für den fleißigen Komponisten, aber die schiere Länge des Werks, vereint mit der Tatsache, dass das Oratoriengenre im 20. Jahrhundert rapide aus der Mode fiel, verhinderte alle Chancen des Werks für seinen anhaltenden Erfolg. Heutzutage haben nur Wenige eine Note aus Christus gehört, und es ist unwahrscheinlich, dass es Wagners Ring bald an Popularität überholen wird. Aber zuerst wurde Draesekes Orchester- und Instrumentalmusik am meisten bewundert. Seine Klaviersonate „quasi fantasia“ (1867) erfreute sich des Lobs keines Geringeren als Franz Liszt, der sie als eine der eindrucksvollsten der Moderne betrachtete. (Wer über dieses Urteil skeptisch ist, sollte versuchen, sie sich selbst anzuhören—sie ist wirklich ein faszinierendes Werk.) Draeseke war zu diesem Zeitpunkt trotz seiner anfänglichen Ausbildung am notorisch konservativen Leipziger Konservatorium schon lange ein Anhänger der „Neudeutschen Schule“ von Liszt und Wagner. Überwältigt von Liszts Aufführungen von Wagners Lohengrin in Weimar, siedelte er sich 1856 selbst in dieser Kleinstadt an, um dort die „Zukunftsmusik“ aufzusaugen und am lebhaften künstlerischen Leben um Liszt teilzunehmen. Seine Reverenz für Liszt manifestierte sich charakteristischerweise in der Komposition symphonischer Dichtungen nach dem Vorbild seines Meisters, und man braucht kaum zu erwähnen, dass der Schatten Richard Wagners schwer über seinen ersten Versuch an einer Oper fiel, deren Titel—König Sigurd—unmittelbar ihre Einflüsse verrät. Sie war sogar eine der frühesten der deprimierend zahlreichen Wagnerimitationen, die junge deutsche Komponisten bewältigen mussten, bevor sie sich ihre eigene Individualität erringen konnten. Selbst Richard Strauss machte mit seiner ersten Oper Guntram eine Nachahmungsphase durch, in der ein einsamer Ritter herumlungert, und wie vorherzusehen in einer Manier, die ein allzu gründliches Studium von Wagners Parsifal andeutet, eine Art vage definierter „Erlösung“ sucht. Draesekes Respekt für Wagner wurde nicht erwidert. Letzterer scheint wenig von Draesekes Musik gehalten zu haben und beschrieb seinen Germania-Marsch—womöglich das einzige Werk von Draeseke, von dem Wagner je eine Aufführung hörte—als „erbärmlich“. Draeseke seinerseits wurde mit der Neudeutschen Schule zusehends unzufrieden, was durch seine tiefe Missbilligung der Affäre Wagners mit Liszts Tochter Cosima beschleunigte wurde. Seit er sich 1876 in Dresden niederließ, begann er eine merkbar konservativere musikalische Furche zu pflügen. 1884 wurde er offiziell zum Personal des Königlich Sächsischen Konservatoriums der Stadt rekrutiert und verbrachte die verbleibenden Jahrzehnte seines Lebens dort. Seine Interessen wandten sich zusehends zur geistlichen Chormusik, oft von ostentativ kontrapunktischen Strukturen eines konservativeren Stils durchzogen. Liszt war nicht beeindruckt. Nachdem er einige spätere Kirchenmusik von Draeseke hörte, bemerkte er bissig, aus dem Löwen sei ein Kaninchen geworden! „Solide Handwerklichkeit“ scheint die Phrase der meisten zeitgenössischen Kritiker gewesen zu sein, wenn sie versuchten, ihren Eindruck von Salomon Jadassohns Musik zu beschreiben; eine Phrase, die ihnen zweifellos wegen seines Ansehens als einer der am längsten etablierten Kompositionslehrer am Leipziger Konservatorium leichter aus der Feder floss. Selbst die erhaltenen Photographien von Jadassohn verbreiten dieses Image eines strikten Pädagogen: seine Augen starren uns unverwandt zwischen einer haarproblematischen Stirn und überluxuriösem Bart an. Jadassohn hatte sich 1848 als Student am Konservatorium eingeschrieben, aber an dieser hehren Institution wurden Stirnen gerunzelt, als sich herausstellte, dass er gelegentlich davonschlüpfte, um beim Erzfeind Liszt in Weimar Stunden zu nehmen. Trotz seiner im Wesentlichen konservativen Tendenzen war der fruchtbare Jadassohn dennoch etwas von der Musik von Liszt und Wagner beeinflusst, und nirgends deutlicher als in seinem Klavierkonzert Nr. 1 in c-Moll, op. 89 (1887), das die traditionelle Anlage (wie etwa bei Draeseke zu hören) zugunsten einer verknüpften Introduction quasi recitativo, Adagio sostenuto und Ballade aufgab. In seinen Proportionen erweist es sich Liszts erstem Klavierkonzert ganz ähnlich, mit einem flüchtig-improvisatorischen Anfangsteil, einem expansiveren langsamen Abschnitt und dann einem Finale, das sich als der komplexeste und längste Satz herausstellt, in dem sich die volle Sonatenform entwickelt, die in den anderen Abschnitten deutlich vermieden wird. Eine frenetisch aufgeregte Coda rundet dieses leidenschaftliche und formal einfallsreiche Stück ab. Auch in Jadassohns Klavierkonzert Nr. 2 in f-Moll, op. 90 lässt sich ein eher einfallsreicher Ansatz zu den üblichen Formanlagen erkennen; es wurde—wie die Opusnummer andeutet—unmittelbar nach dem ersten Konzert komponiert. Jadassohn scheint von den Möglichkeiten, die es bot, die Konturen der Form erneut zu variieren, zur Komposition des zweiten Stückes inspiriert worden zu sein. Hier komponiert er einen relativ vorschriftsmäßigen, aber eindrucksvollen Allegro energico-Kopfsatz, dessen grimmig-marschhaftes Hauptthema im Gegensatz zum flüchtig verzweifelnden Rezitativ des op. 89 in britischen Ohren wie eine Mollfassung der „Men of Harlech“ (in Heinrich Möllers deutscher Fassung „Seht, es leuchten die Fanale“) klingt. Auch der letzte Satz, Allegro appassionato, ist eine erweiterte Sonatenform, deren Coda sich diesmal nach Dur wendet, um den jubelnden Abschluss zu liefern, den op. 89 so deutlich verweigerte. Aber der langsame Satz scheint am kreativsten mit den Erwartungen des Hörers zu spielen. Nach einer vom Klavier vorgestellten reizenden Andantino quasi Allegretto-Melodie in As-Dur führt eine kurze Kadenz des Solisten in schnellere Musik über, die in einem Allegro deciso in f-Moll endet, das so klingt, als ob es der Anfang des Finales sein sollte. Die Andantino-Melodie scheint nur eine bescheidene Einleitung zum letzten Satz gewesen zu sein—ist sie aber nicht. Die Musik verlangsamt sich wieder, das Andantino kehrt zurück und verklingt schließlich in einem einem gemächlichen trägen Nebel von As-Arpeggien. Diese Träumerei wird abrupt von einem dramatischen Signal der Trompeten unterbrochen. Jetzt können wir uns endlich für den letzten Satz gemütlich zurücklehnen—was vorausging, war nur eine sanfte, geniale Täuschung. Nach dem Anhören der Konzerte auf dieser CD könnten wir uns fragen, was schief ging, warum drei perfekt respektable, gekonnt geschriebene und akzeptabel einfallsreiche Stücke nach dem Tode ihrer Komponisten im Abfalleimer der Geschichte landeten? Immerhin ist nicht jedes berühmtere Werk ein Modell an Perfektion. Der erste Satz von Brahms’ d-Moll-Konzert scheint ewig zu dauern, wenn der Hörer mit Entsetzen erkennt, dass der Komponist die gesamte Exposition Note für Note wiederholen will, und das Klavierkonzert von Edvard Grieg kleistert seine eingängigen Melodien mit der musikalischen Entsprechung von Schnur und Pflaster zusammen. Griegs Lehrer Jadassohn ist zumindest in dieser Hinsicht wesentlich versierter. Zwei mögliche Gründe scheinen auf der Hand zu liegen: ein künstlerischer und ein politischer. Trotz all ihres kompositorischen Geschicks besaßen weder Draeseke noch Jadassohn die Fähigkeit, Melodien zu erfinden, die unmittelbar voller musikalischer Möglichkeiten steckten und sich störrisch im Ohr des Hörers einnisten. Der Anfang von Brahms’ d-Moll-Konzert ist so unvergesslich erstaunlich, dass man bereit ist, in seiner späteren Verarbeitung eine gewisse Langatmigkeit zu vergeben, während Griegs Konzert schlicht ein Wunderhorn eingänglicher Melodien ist. Sie mögen zwar keine makellosen Stücke sein, sind aber auf keinen Fall fade. Und zu Draesekes und Jadassohns Schaden war nicht nur ihr musikalisches Material weniger fesselnd, sondern ihre Werke erlitten auch einen unerwarteten Schlag durch die Geschichte. Als deutsch-jüdischer Komponist wurde Jadassohn im Deutschland der 1930er Jahre bewusst unterdrückt. Nach dem Ende der Naziperiode war sein Name fest in der Liste „interessanter historischen Gestalten“ eingemeißelt, deren Musik nicht einmal gut genug bekannt war, um selbst oberflächlich ihren Wert einzuschätzen. Draeseke erlebte ein ironischeres Schicksal. In krassem Kontrast zu Jadassohns Œuvre wurde seine Musik als Beispiel „reiner deutscher Kunst“ gepriesen. Die 1930er Jahren erlebten sogar eine Mini-Draeseke-Wiederbelebung, die weitgehend eher von den Behörden als von der Begeisterung der Bevölkerungsbasis angefacht wurde. 1945 fand die unvermeidliche Reaktion statt: Draesekes Musik war mit den politischen Assoziationen behaftet, für die sein Komponist kaum verantwortlich war. Er geriet wiederum in Vergessenheit. Etwa hundert Jahre nach ihrem Tode gibt diese Einspielung den Hörern endlich die Gelegenheit, zu ihrem eigenen Urteil über die beiden Komponisten zu kommen.